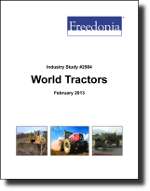 This study analyzes the $88 billion world tractor industry. It presents historical demand data for the years 2001, 2006 and 2011, and forecasts for 2016 and 2021 by market (e.g., agriculture, construction, mining, consumer and commercial), product (wheeled, crawler, pedestrian-controlled), world region and for 23 countries. The study also considers market environment factors, details industry structure, evaluates company market share and profiles 40 industry participants, including Caterpillar, Deere, and AGCO.